What used to be seen and heard of only on popular American sitcoms and rom-coms, is now becoming one of the best go-to exercise routines for many people aiming at being fitter. Pilates, a workout that balances core-strengthening with mind-clearing concentration, is one of our favoured ways to improve posture, balance and flexibility. If you are getting bored of hitting the gym everyday, we've rounded up a list of the best pilates classes in the city for you. Go and check them out for yourself, and who knows you might find a new favourite workout in pilates. This studio in Andheri West, Hughes Road and Santacruz West is the brainchild of Samir and Namrata Purohit (renowned Pilates trainers) and authors of The Lazy Girls Guide to Being Fit. We love the attention they give in their one-on-one classes (INR 16,000 for 8 sessions per month and INR 21,500 for 12 sessions per month). They’re also exemplary trainers when it comes to building form and giving the right posture. Price: INR 2,500 for a single session. Yasmin Karachiwala is a renowned trainer and pioneer of reformer pilates in India, and we checked out her classes in Bandra. Half of Bollywood goes to Yasmin for their pilates training – we spotted Alia Bhatt and other celebrities' posting Instagram videos lauding Yasmin's training. So celebrity spotting is inevitable. They also offer independent gym packages for when we want to mix it up. Price: INR 3,000 for a single session. Activ8 is the Pilates studio next door – homely, welcoming and friendly. The cool thing about Activ8 is that they offer group classes for one, two, three or five people, which means that families and couples can make this a fitness experience to enjoy together. The studio also offers altitude training and counts professional mountaineers, marathon runners, cricketers and celebrities in its clientele. Altitude training is held between 7AM-12 noon and 5 PM-9 PM. Pilates training is held between 7 AM-1 PM and 5 PM-9 PM. Price: INR 1,500 for a single session for pilates and INR 12,000 per month for altitude training (12 sessions). Radhika Karle is certified from the the renowned Balanced Body institute based in USA. Besides being Sonam Kapoor’s trainer — Radhika even travels with her when she leaves Mumbai — Radhika is a qualified nutritionist who can map out healthy eating habits for us as well. Her studio doubles up as a training centre for aspiring instructors as well. The studio offers Reformer and Chair Pilates. Price: INR 2,750 for a single session. For 12 sessions it will cost INR 2,250 per session and for 36 sessions it will cost INR 1,700 per session. 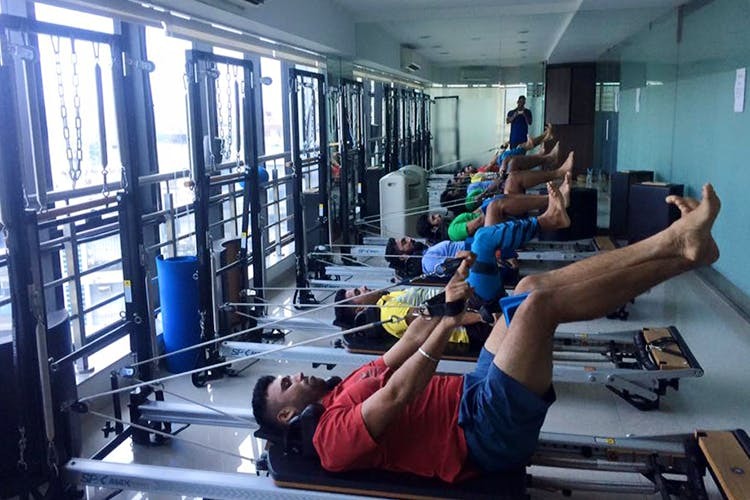 Body Craft House is a very popular studio in Bandra that combines a variety of forms like power yoga, pilates, functional training and other workouts to create the perfect customized plan for you to reach your goals. The experienced trainers at BCH aim at helping aspirants be functionally fit by improving strength, stability, balance, and coordination. While they're great for pilates training, they also offer yoga, kick boxing, circuits, station workouts and more. Price: INR 1,800 per session. For a month, it will cost you INR 18,000.